Nothing new under the sun? Maybe not...but just walk under the crescent shaped moon that hangs above the entrance to Luna Sound and you'll find yourself in a wonderland of recording technology. 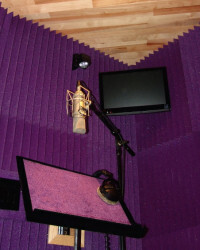 If you're looking for an audio or video recording studio, we invite you to consider Luna Sound. To put it simply, Luna Sound can not be matched! We offer the absolute highest level of recording quality at only a fraction of the price of comparably equipped studios. Luna is the #1 recording studio for Christian artists. We have recently upgraded our entire studio and our line of equipment to present you with the New Bigger Better Luna Sound! We provide high quality Audio and Video Recording & Editing services in SD & HD. Luna Sound is also the proud recipient of the 2006 Grammy Contest for Videography. Recording technology - the 90's witnessed an increasing demand for "no-noise" digital recording using the Mac 2fx & SoundTools. With the introduction of digital recording, new standards of quality have been established in the music industry. Using the Mac Pro computer/ Pro Tools HDX, FCP and an assortment of AAX plug-ins software packages, we are able to provide you with a no noise, "better than CD quality" product. Our system allows us to go direct-to-disc; this means no tape...no noise...only pure digital sound. We mix down onto DVD/CD and hand you the highest quality recording attainable. All site content is ©Copyright 2019 Luna Sound. All rights reserved. Reproduction in whole or in part without permission is prohibited.